The rent at Super Cute! Apartment for Rent! Apartments ranges from $995 for a one bedroom to a $1,265 two bedroom. Apartments in this building are about 6% more expensive than the Bear Canyon average. This is a pet-friendly apartment. 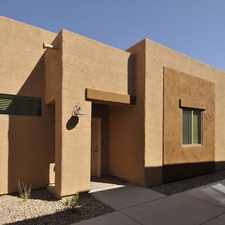 This apartment is in the Bear Canyon neighborhood in Tucson. Super Cute! Apartment for Rent! Apartments has a Walk Score of 39 out of 100. This location is a Car-Dependent neighborhood so most errands require a car. We want you to love where you Live! Bear Canyon is located at the foot of the Santa Catalina Mountains, our community not ony takes your breath away but also places you where you need to be. We are within reach of the Park Place Mall, 4th Avenue and provide easy access to nine golf courses and the airport is only 30 minutes away.Designed with comfort and functionality in mind, each of our floor options will impress you from the moment you step through the door. At Bear Canyon, our floor plans feature all electric kitchens, nine foot ceilings, large walk-in closets,full size washer and dryer and spacious living areas. Not only do we welcome you, we welcome your furry friends too! Ask us about our pet policy- some breed restrictions apply. In addition to these comforts, our community amenities will also amaze. Take a refreshing dip in one of our two resort-style pool or work-up a sweat in our 24 hour fitness center, there is something for everyone!Come visit our breathtaking views and elegant architecture here at Bear Canyon. It's about community! Explore how far you can travel by car, bus, bike and foot from Super Cute! Apartment for Rent! Apartments. Super Cute! Apartment for Rent! Apartments has minimal transit which means it is possible to get on a bus. Super Cute! Apartment for Rent! Apartments is in the Bear Canyon neighborhood. Bear Canyon is the 100th most walkable neighborhood in Tucson with a neighborhood Walk Score of 31.